OMB Director Mick Mulvaney stepped in for Sean Spicer at Tuesday's briefing and attacked Democrats for claiming the bipartisan deal to fund the government was a victory over President Trump. On Trump's shutdown tweets: The president is "frustrated" that Dems "went out there to spike the football and make him look bad." On Democrats stalling: "They wanted a shutdown. They were desperate to make this administration look like we couldn't govern," said Mulvaney. "If the Democrats aren't going to behave any better than they have...[a shutdown] may be inevitable." 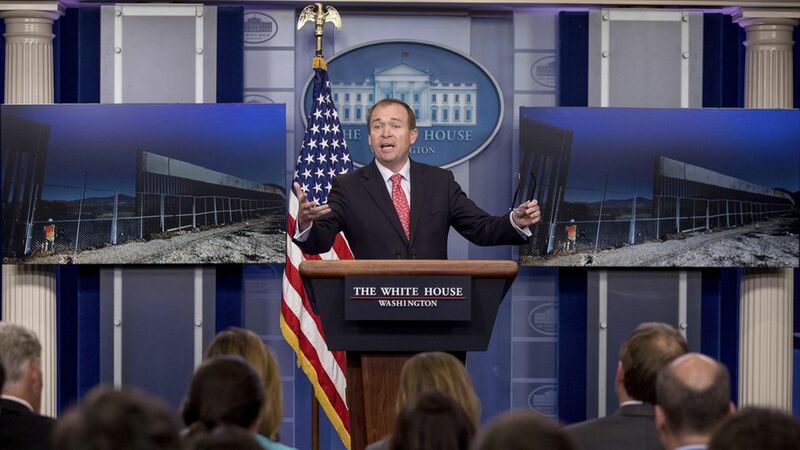 The border wall: Mulvaney pointed to photos of a new, taller "replacement wall" and said the Democratic base "aren't going to like that, but they're going to need deal with it." On Planned Parenthood: "If you want to prove to the folks back home that you are pro-life, vote for the Planned Parenthood bill."